For baby #2, I decided I wanted to switch up the nursery a little bit. I love what I had for Henry, but my style has changed a bit in 3 years, and I love a little DIY, so I will be posting on here a series (as I get the time to do it) of how I'm changing the nursery. 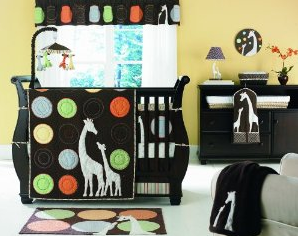 With Henry, my love of giraffes took over the nursery. 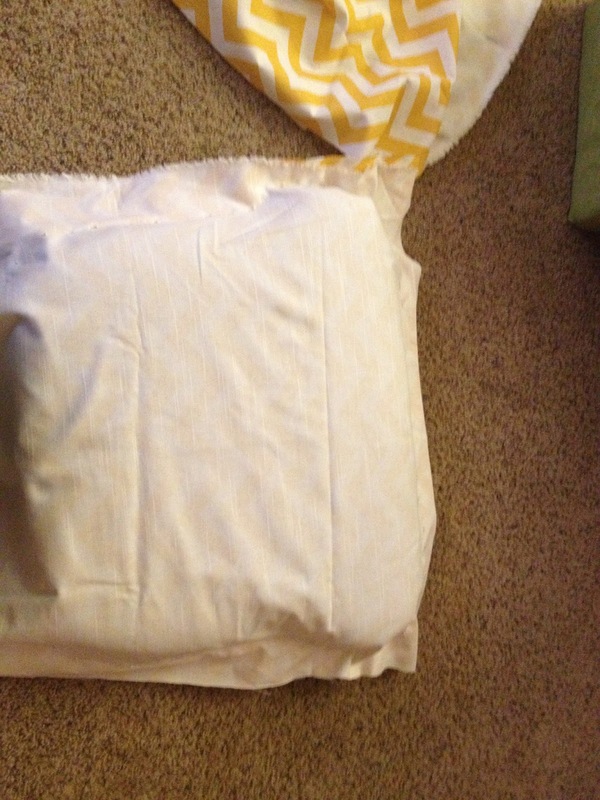 I got a few pieces from the Carters Tall Tales bedding set. I got the lamp, a sheet, a wall art piece, and a blanket. 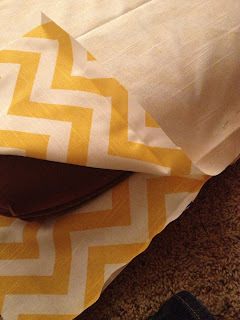 I put in some other fabrics I had and browns to make it mix. This time around, I still like the white and brown, but I want to add in some modern spin. I'm taking the rocker currently in our nursery and moving it to Henry's big boy room, so he'll have a piece of consistency. My mom had this wonderful old glider at their house, and offered it to me to use. As you can see, it's a little dated, but still wonderfully functional. I ordered this zig-zag/chevron/whatever you want to call it fabric from fabric.com. 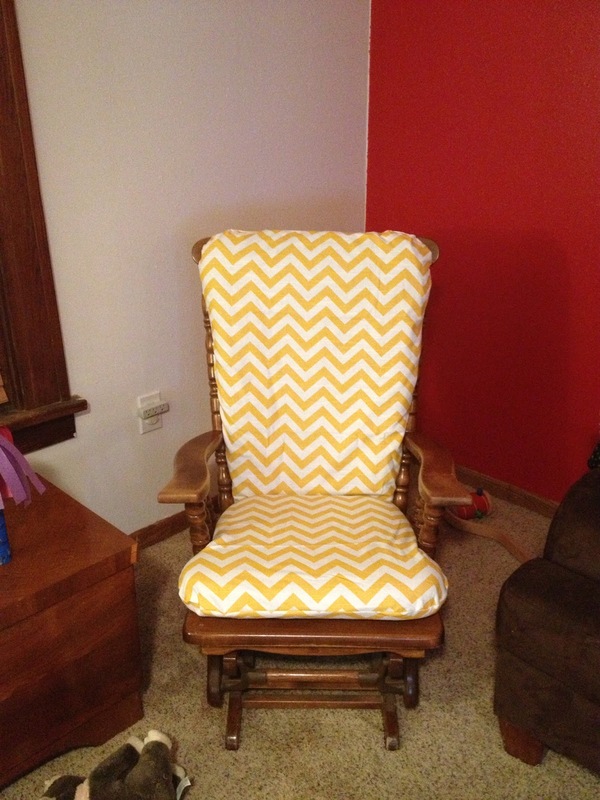 I like it because it's a decorator weight fabric, so it will wear well on a chair. I didn't have a pattern, and I don't really use patterns much (hence my Etsy store motto: Made with love, not a pattern). 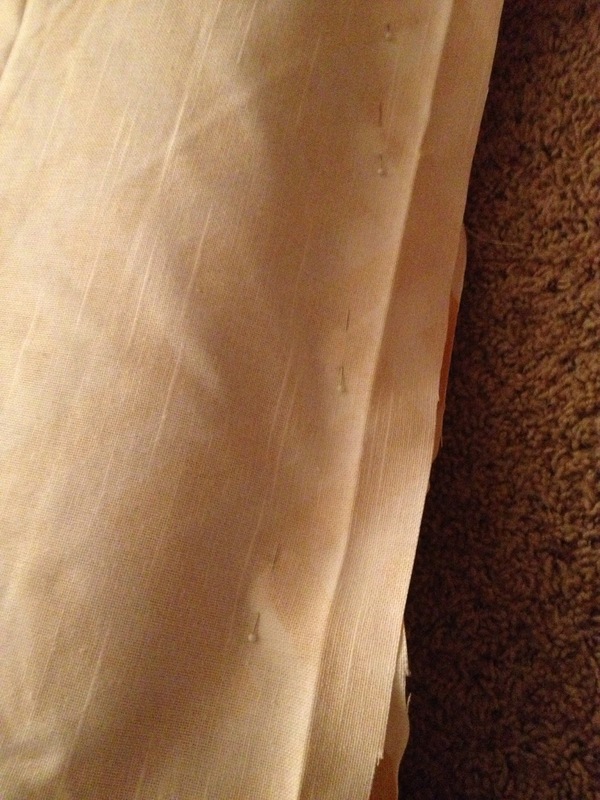 I laid down the cushion between the fabrics with right sides facing the cushion. Then, I pinned around the cushion closely. I had to have my husband's help getting the cushion out of the pinned fabric because it was a tight squeeze. 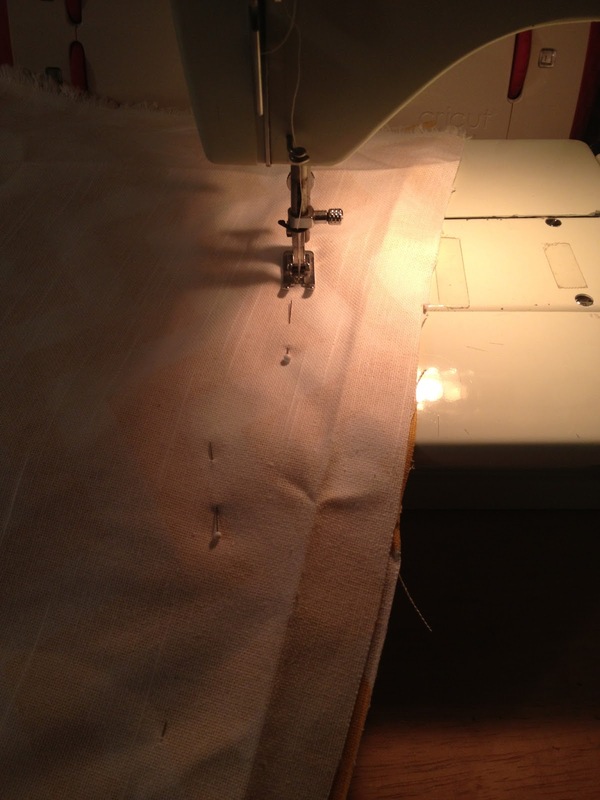 I sewed around following the pins. 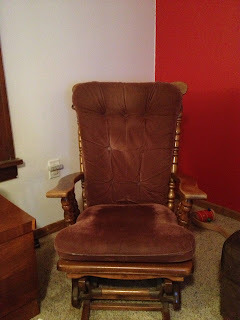 I left the end toward the back of the rocker open on the seat cushion and the end toward the bottom open on the back cushion. Then, I stuffed the cushions back in. I had to make a minor adjustment to one of the curves on the back cushion to match the other, but otherwise, it was a quick project. I still plan to put in a zipper, buttons, or ties to close the open ends and add ties to attach the back cushion to the chair, but making the fabric fit the cushion was probably the most difficult job. I ordered 4 yards, but I just checked and I have 2 yards left. I didn't have any re-dos or mess-ups, so I lucked out. :) I always like to have a little extra fabric, but I think I went overboard. I'm sure I'll find lots to do with the extra because I LOVE it, but I think you'd be safe with 2 1/2 or 3 yards. I'd love to see your finished product when you're done! Perfect! I think I will get 4 also because mine has a foot stool thing and then I can use any leftovers in the room! Thanks so much! I will definitely post pictures on my blog and I'll let you know!